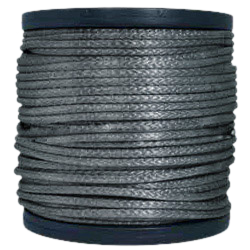 CWC 12-strand Dymax® is a Dyneema® rope with 100% SK65 fibers. Heat set under load with fiber bond treatment. Pound for pound, Dymax strength is comparable to wire rope, at a fraction of the weight. 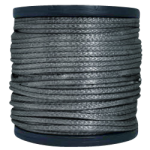 It floats, making it ideal for commercial fishing, vessel mooring lines, tug winch lines, emergency towlines, utility winch and pulling lines, recreational winch line and theatrical rigging lines. Comes standard with a polyurethane finish for a firm lay and abrasion resistance.